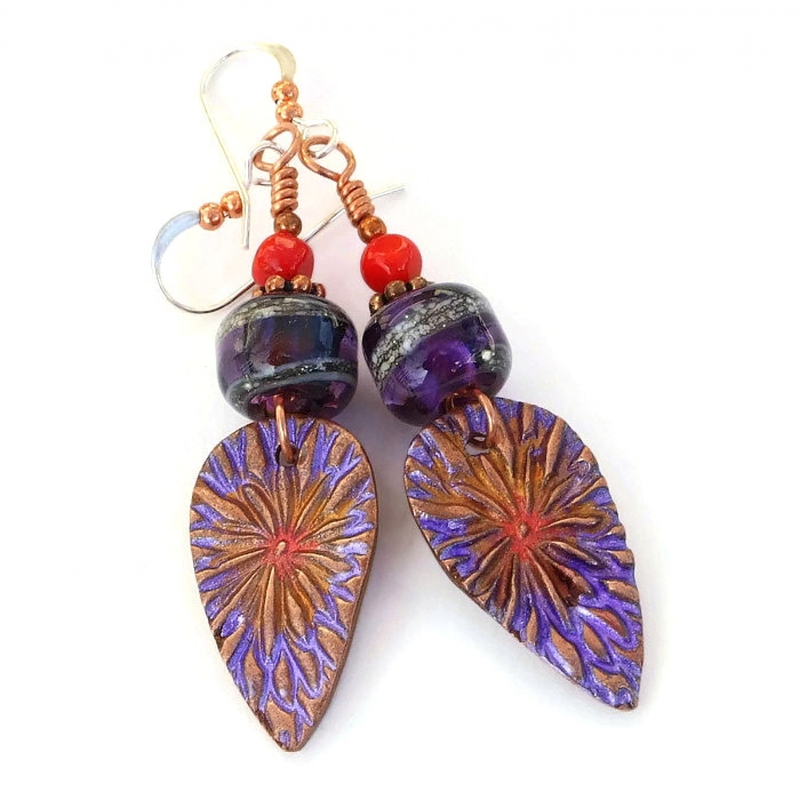 The unique FLORAL FIREWORKS boho earrings add nature inspired floral beauty to your outfits each and every time you wear them. 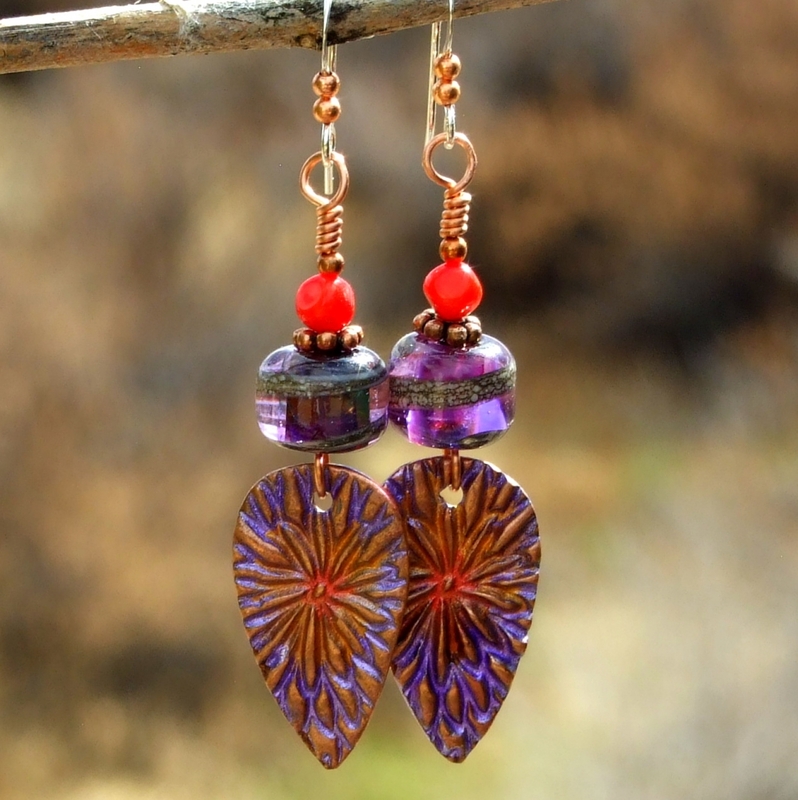 The one of a kind earrings feature artisan handmade copper teardrop charms. They have a hand painted purple and red many petaled floral design that reminds me of fireworks. 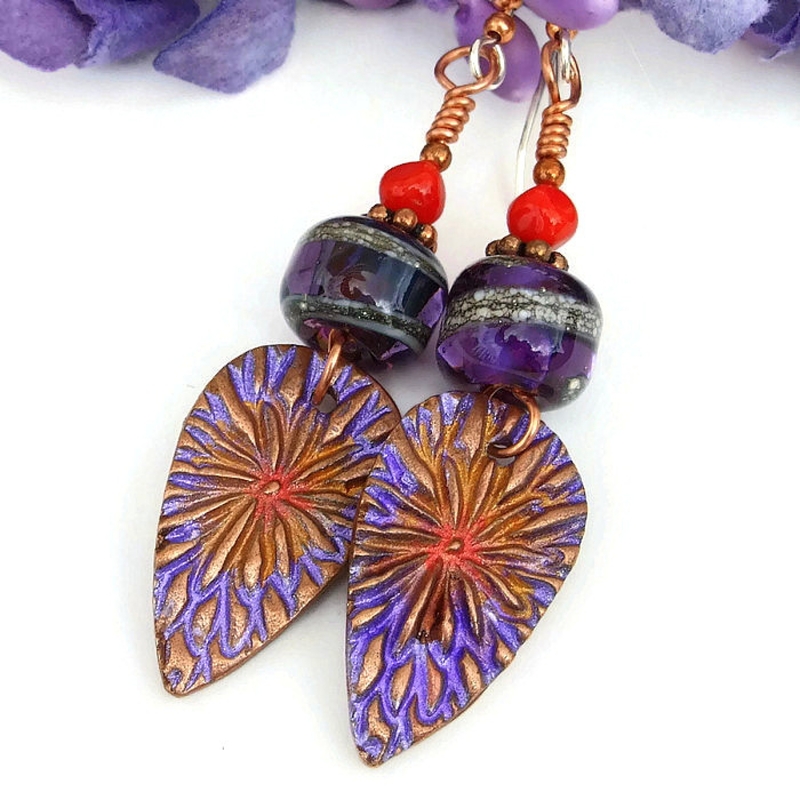 Stacked above the flower charms are artisan purple lampwork beads with a swirl design and red coral nuggets. 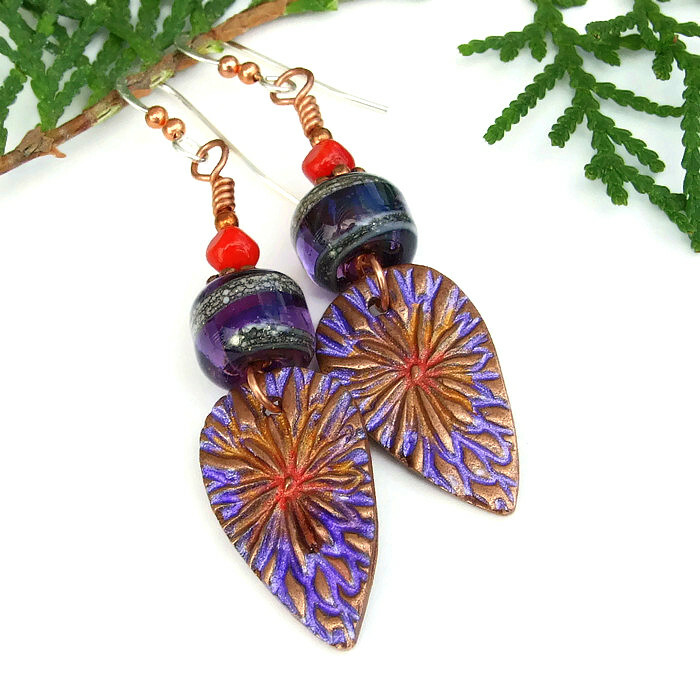 Just imagine wearing these colorful earrings with your little black dress as well as your comfortable blue jeans and a white shirt - perfect! 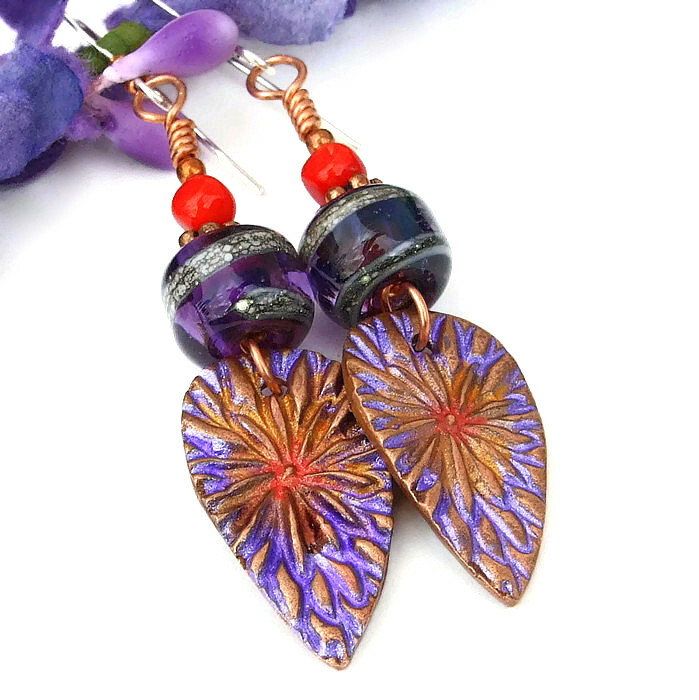 The FLORAL FIREWORKS earrings were carefully designed and handmade by Catherine of Shadow Dog Designs for the woman who loves to wear jewelry with standout boho style. 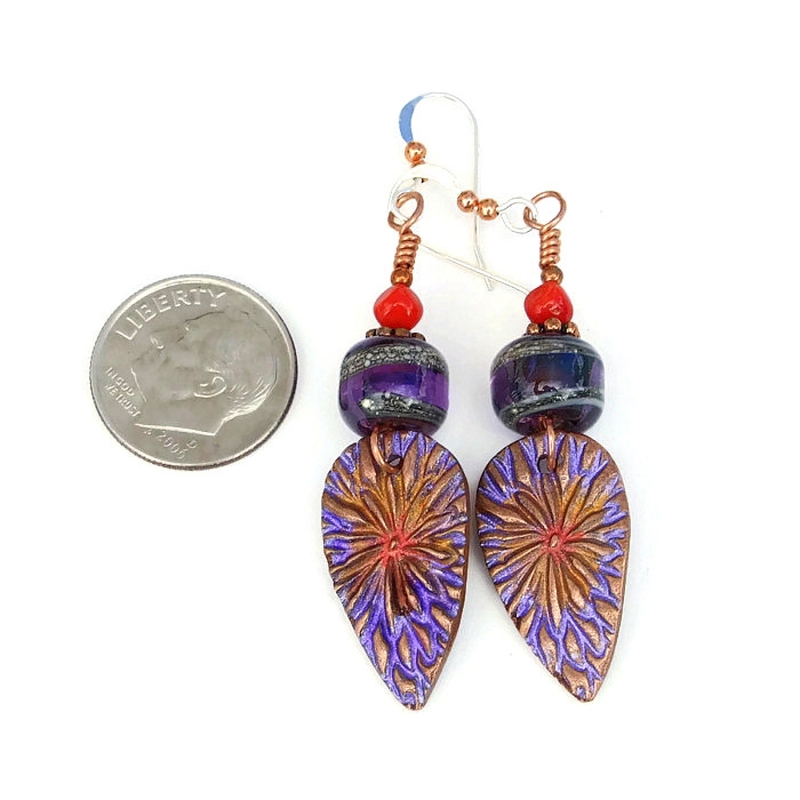 *** For a better understanding of the relative size of the FLORAL FIREWORKS artisan handmade flower earrings, please be sure to check out photo # 6 for a size comparison with a dime. 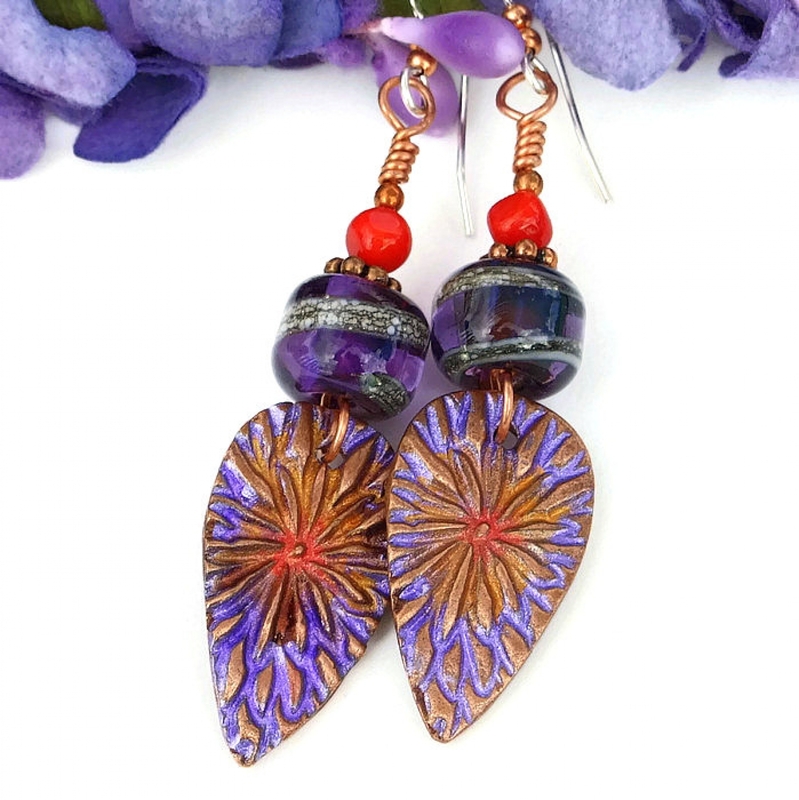 The copper flower charms used in the FLORAL FIREWORKS earrings were individually handmade and hand painted by Kristi of Kristi Bowman Design. 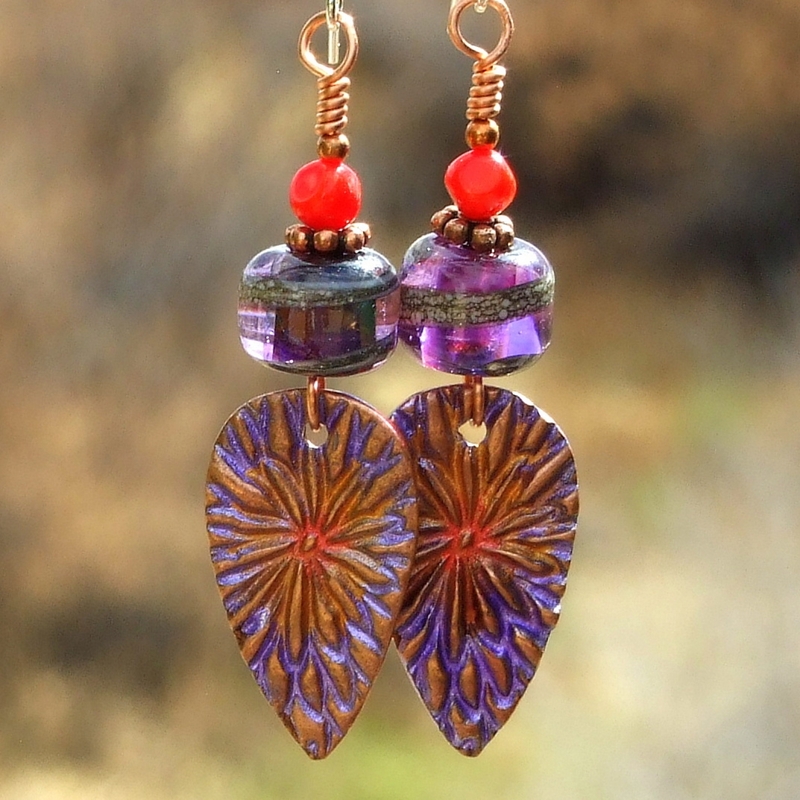 Kristi created the teardrop shaped charms from start to finish out of copper precious metal clay, an artist's clay that is saturated with tiny copper particles, an organic binder and water. She molded, shaped and imprinted / carved each individual charm and then put the pieces in a kiln. The flowers were fired at a high heat, where the binder and water were burned off, leaving pure copper. To bring out the glorious detail of the textured flower fireworks, the charms were individually hand painted with red and purple metal paints, the paint settling in the grooves which allow the gleam of the copper to show in the raised areas. The charms were coated with a sealant to keep the colors bright and beautiful for years to come. The lampwork glass beads were also individually artisan created. The base is a translucent purple glass that absolutely glows when backlit (see photo #3). A spiral of silvery beige glass was then added for extra eye catching beauty. 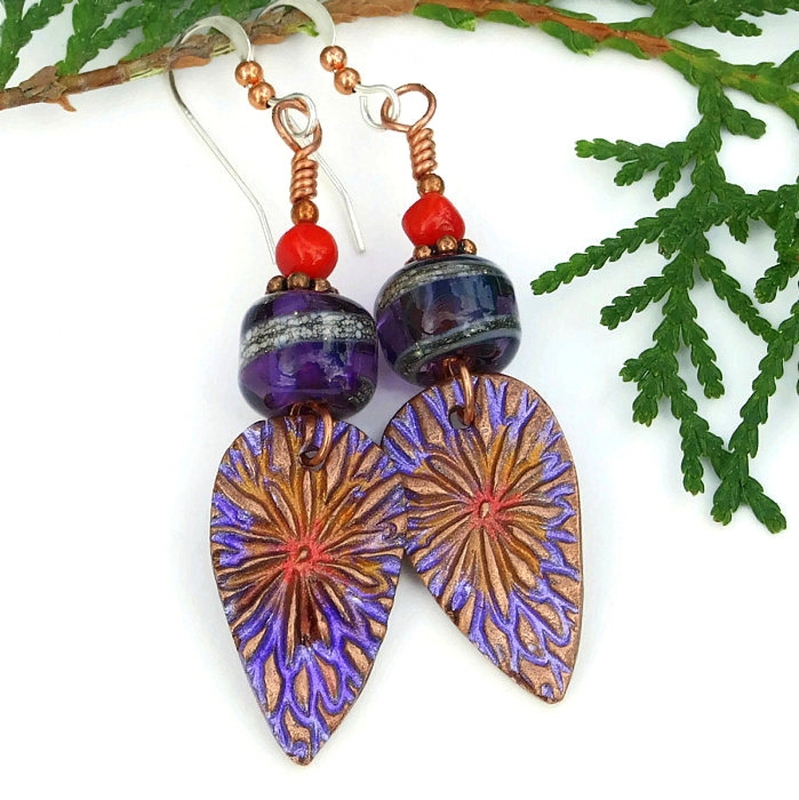 A copper daisy spacer was placed on top of each purple lampwork bead. On top of the daisy spacers are radiant red coral nuggets for a pop of intense color. Since the red coral pieces are nuggets, they are very similar in size and shape but not exactly. 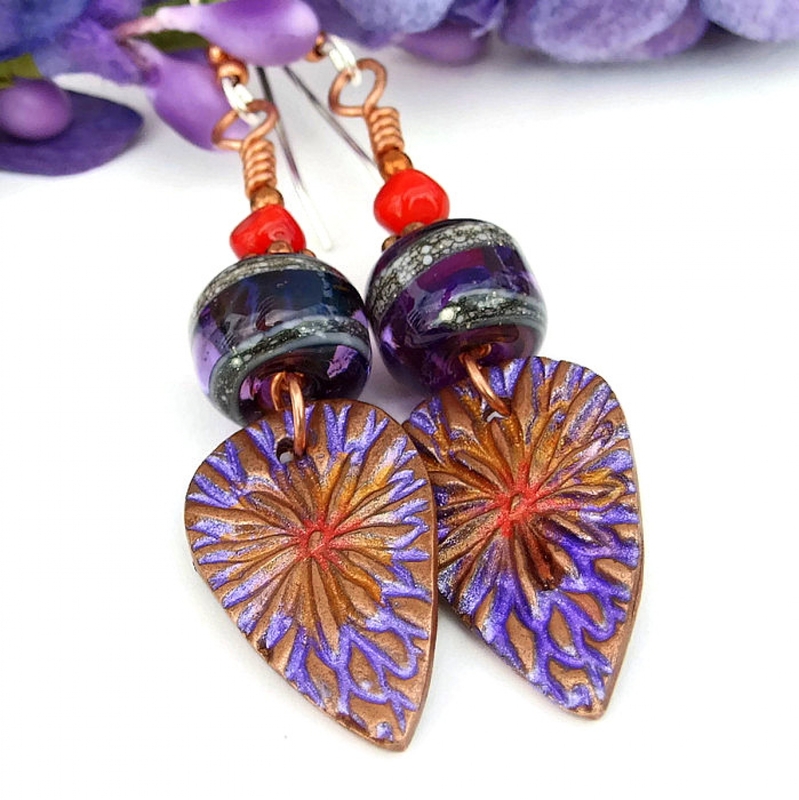 All of the elements used to created the FLORAL FIREWORKS earrings were carefully wire wrapped on copper wire and then connected to sterling silver French hook earwires. 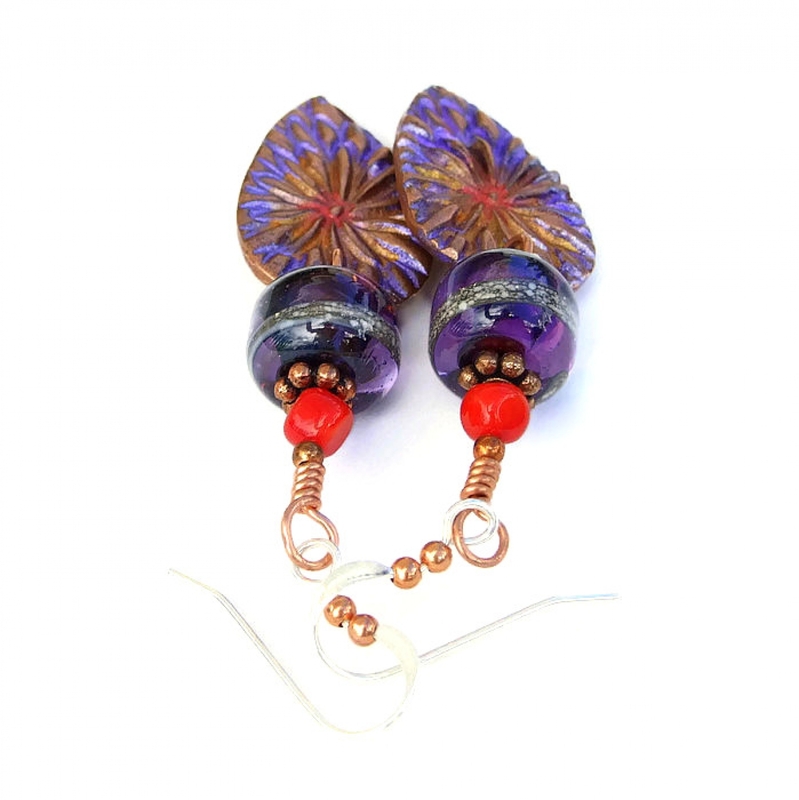 Copper bead accents were added to each earwire for extra adornment. Through the centuries, flowers have been a symbol of spiritual awakening; also they have been symbols of generosity and love when they are given away. Copper is said to allow the wearer to recognize barriers in the path of personal development. Even though man made, glass carries the energies of transformation, rebirth and communication. Red Coral is used to help calm life, to restore harmony in the event of an emotional conflict. Silver is a metal of love and healing; it is a mirror to the soul, helping us to see ourselves as others see us. 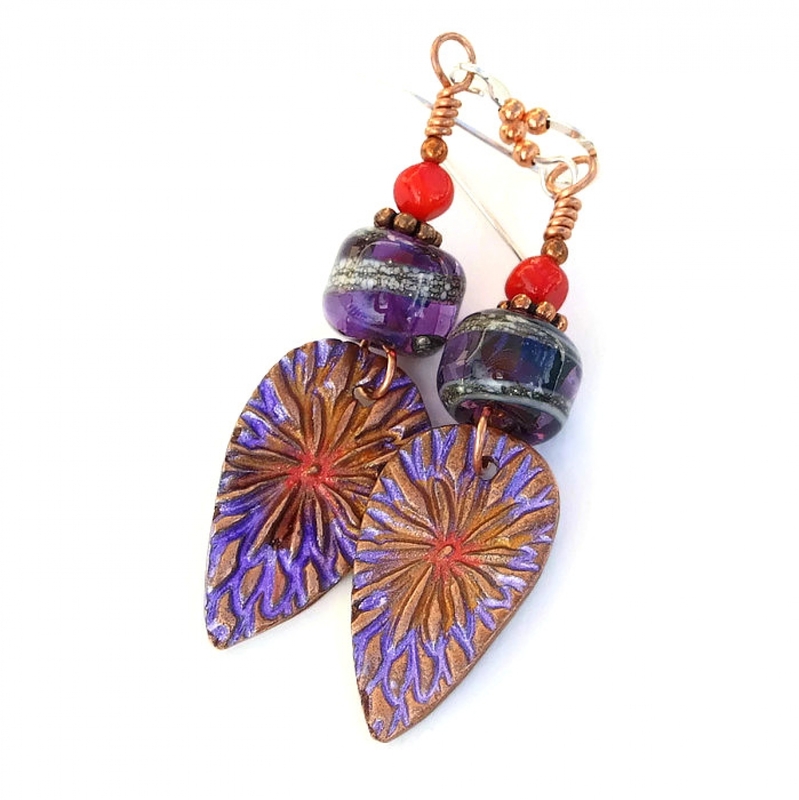 The FLORAL FIREWORKS handmade earrings were carefully designed and handmade in a dog friendly, smoke free studio. They will be carefully packed in an organza jewelry bag with tissue, perfect for gift giving to a loved one . . . or to yourself!